Bruno and Spencer continue to go on walks every day. It is a big part of what keeps them calm and well balanced. The walks are anywhere from 1 to 7 miles depending on the weather. Watch Bruno and Spencer's reaction to a barking Beagle while out on a walk. Bruno and Spencer have learned to be very good posers. I can prop them in front of things and ask them to stay while I take pictures. I am sure they do not understand why I am holding an object up and pushing buttons, but they stand there waiting for the come command just the same. Their reward is a "Good Boys" and a pat on the head or scratch behind the ear. I in return get a lick on the face. Here they are posing in front of a geese decoy at one of the parks we visited. On the really hot summer days rather than just not go out at all, I find places to walk that have access to water. Both Bruno and Spencer will swim in a pond in water over their heads, therefore I know neither dog is afraid of water. 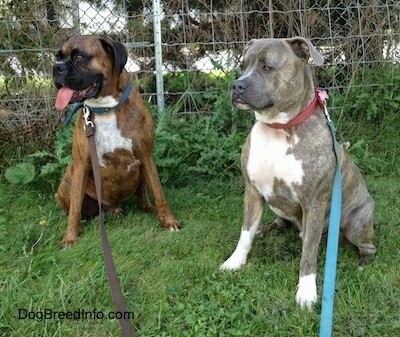 This picture shows one of the definite personality differences between the two dogs. Bruno will walk into puddles and even mud, whereas Spencer avoids puddles and mud. If Spencer is not hot he prefers not to get his feet wet. In this picture we were crossing a shallow stream. 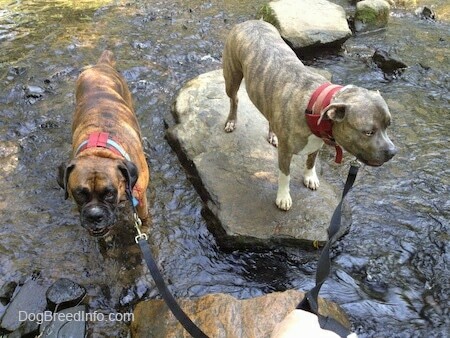 Bruno walked right into the water and Spencer walked on top of the rocks—no need to get his paws wet if he does not have to. 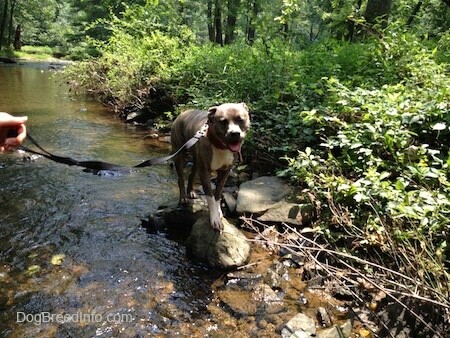 And in case you were wondering, when Bruno gets into the water it's not because he does not know how to walk on top of the rocks; he is very good at hopping rocks and does it all of the time. He just likes the water, too. 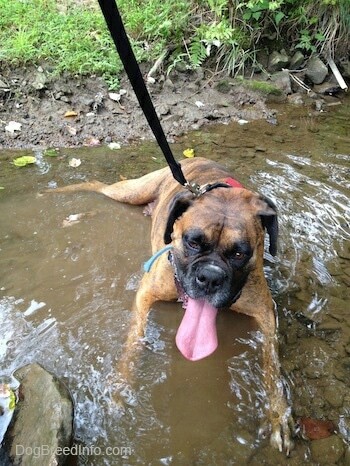 Bruno decides he will just lie down in the water. Spencer spots a rock and decides to dry his paws.